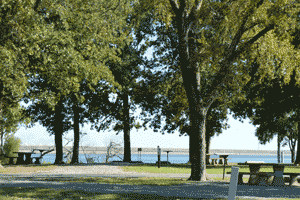 East Burns Run Campground is located near Cartwright, Oklahoma, on Lake Texoma’s Oklahoma’s Cross Timbers Region. A large day-use group picnic shelter with electricity and playground is available – a favorite setting for family reunions, corporate retreats and weddings. East Burns Run has 53 campsites, 44 of which have electrical and water hookups. Other amenities include flush and vault toilets, showers and drinking water. 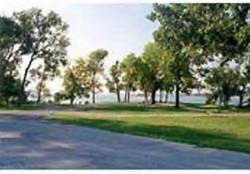 A dump station, two boat ramps, a dock, playground, swimming area and beach are located on-site. Restaurants and stores are available about ½ mile from the campground. Entrance gates are open from 6 am to 10 pm. Changes to campsite numbering: Numbers for some campsites in this park have changed for the upcoming 2015 camping season. Please check the park map to verify the campsite you wish to make a reservation for is correct. October 1, 2016 through March 31, 2017: Reduced camping will be available on a first-come, first-served basis (no reservations are accepted). Shower and bathroom facilities will not be open and individual water hookups will only be available through October 31, 2016; after this date campers will need to fill fresh water tanks from the frost free hydrant located near entrance of park. Gate attendants will not be on duty; therefore, camping fees should be paid at the honor vault station. Camping fees will be reduced and are posted at the vault station. Please contact the Lake Texoma Project office at (903) 465-4990 x 0 for additional information.